Lets talk Kitchen! Thyme & Table is a lifestyle brand geared toward the home chef who enjoys elevated materials. Bringing a sense of restaurant and "foodie" style to your kitchen, storage and cleaning basics. Thyme & Table has revolutionized the cooking, cleaning, and organizing experience through trendy colors, prints, and elevated materials.The Thyme & Table 3-Piece Non-Stick Coated Stainless-Steel Knife Set includes an 8-inch chef knife, a 5-inch utility knife, and a 3.5-inch paring knife. Chef knife: The chef's knife offers versatility and ease of use. Both the blade length and height make it perfect for slicing, dicing, and mincing, while keeping knuckles off of the cutting surface. The blade's rounded edge also allows for the rocking motion recommended by professional chefs to create even cuts and reduce fatigue. Utility knife: The utility knife is a testament to its name. While this knife is great for most cutting tasks, its small size and pointed edge make it ideal for trimming meat for bones. The rounded edge, similar to a chef's blade, makes rocking for fine slicing and mincing effortless. Paring Knife: The paring knife is a kitchen staple. Don't let its small size fool you, this multi-tasker is great for peeling, and trimming. The short blade makes for easy control and precision while peeling fruit and vegetables. The angled front of the blade is perfect for making garnishes. 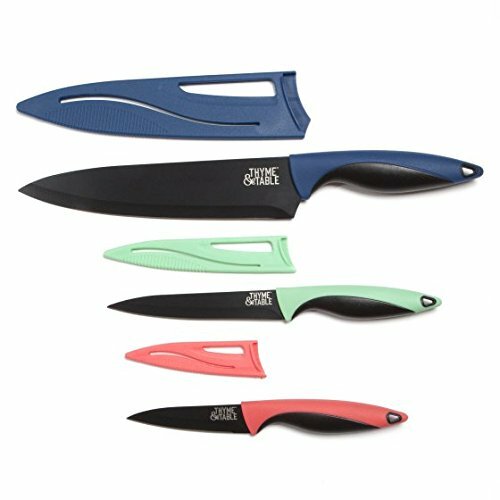 This elevated knife set comes with the pairing knife in coral, the utility knife in seafoam, and the chef knife in navy. The non-stick blade is black for all of the knifes in the set. Each knife in the set has a comfort grip handle and includes a sheath. Check out www.thymeandtablekitchen.com or @thymeandtablekitchen to learn more about the product! If you have any questions about this product by Thyme & Table, contact us by completing and submitting the form below. If you are looking for a specif part number, please include it with your message.